V&A Jewellery - Mughal ring - made in the Mughal Empire in the 18th century, a magnificent gold thumb ring inspired this modern version. It comes gold-plated in four hand-enamelled variations - mauve, red, green and yellow. This piece is inspired from an object in The Victoria and Albert Museum, London. V&A Jewellery: This range was inspired by a reversible necklace made by Robert Phillips for the Paris Exhibition of 1867. 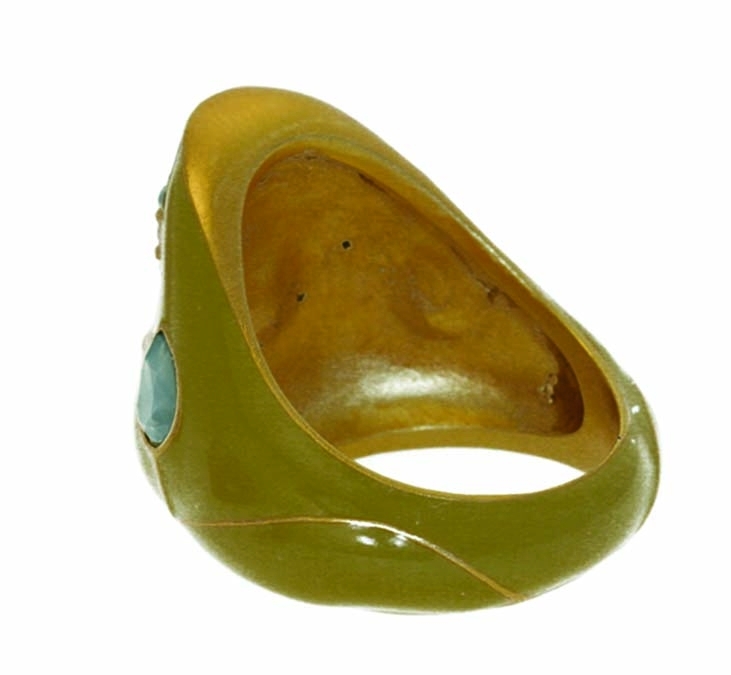 V&A Jewellery - Mughal ring - made in the Mughal Empire in the 18th century, a magnificent gold thumb ring inspired this modern version. V&A Jewellery: This ring is inspired by a magnificent gold thumb ring made in the Mughal empire in the 18th century. V&A Jewellery - Mughal-inspired reversible red and green pendant: This range was inspired by a reversible necklace made by Robert Phillips for the Paris Exhibition of 1867. V&A Jewellery - Mughal-inspired reversible red and green earrings: This range was inspired by a reversible necklace made by Robert Phillips for the Paris Exhibition of 1867. V&A Jewellery - Daffodil Earrings: Inspired from an enamelled gold pendant, set with brilliant-cut diamonds, emeralds, a ruby, and hung with a pearl, probably made in Germany, about 1903. V&A Jewellery - Pugin Enamel and Pearl Brooch: This pugin brooch is gold plated and hand enamelled.